Home » Colon And Digestive » Poor digestion? Lemon water can help! Poor digestion? Lemon water can help! When you wake up every morning you probably opt for a cup of coffee or tea. Both are great options to kick-start your day, but there is an even better beverage that will not only make you feel good, but can provide you with all-day health benefits as well, including aiding in digestion. The magical beverage we’re talking about is lemon water. You may have heard the buzz about lemon water, but maybe you never really understood what was so great about it. Well, that is why we are here: to explain all the health benefits that lemon water can provide and give you even more reasons to consume it on a daily basis. As mentioned, tea or coffee can give you the jolt you need to start your morning, but unfortunately caffeinated beverages can make you crash later in the day. Lemon water, on the other hand, not only energizes you, but won’t leave you groggy in the afternoon. You see, even the smallest amount of dehydration can make you tired, so it is often recommended that you drink water to stay alert. By adding lemon to your water you’re adding that extra, slightly sour kick, making it a great alternative to coffee or tea. If your digestion is bogging you down, a daily drink of lemon water first thing in the morning can help ease your troubles. There are minerals found in lemons that can help promote digestion, reduce heartburn, and reduce bloating by loosening up trapped toxins. Start your day off with some lemon water, and then again later if you feel your digestive issues are beginning to creep up on you. Potassium is an essential mineral that our bodies require – especially if you have high blood pressure because it can help lower it. If you have trouble getting enough potassium in your diet, lemon water is an easy way to incorporate more. Furthermore, potassium also aids in muscle-building and helps breakdown and use up carbohydrates. If you’re feeling stressed out, reach for some lemon water; the mere scent of lemon is enough to help boost mood and reduce stress. If you can’t keep your hand out of the snack drawer, drink some lemon water instead. 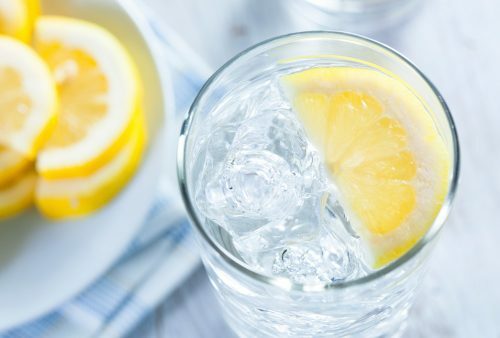 Not only does water help us feel full – often when we feel hungry we are actually just thirsty – but lemon water also reduces the temptation to eat fatty foods, which can aid in weight loss. Lemons contain vitamin C, which is a known vitamin for boosting our immune system. Furthermore, lemons have less sugar than oranges, making them a great alternative. Lemons contain antioxidants, which have been shown to improve the appearance of skin and prevent wrinkles, blemishes and free radical damage. Lemon water helps purify the skin, removes toxins and leaves us with a glowing complexion. If you needed a reason to start drinking lemon water daily, we just provided you with seven! Start infusing your water with lemon to experience the many benefits of lemon water today.